The good thing about the current television market is that there are a lot of great options. In fact, there are over 118.4 million TV sets in the US today, as per a Nielsen survey reported. We have Smart TV sets and HDRs. We have OLED TV sets and we have LED screen TVs. The list of products and brands and series alone are astounding. The bad thing about the current market is that we have so many choices and those choices branch out, especially for necessary accessories. One of the most important accessories is the wall mount. We all know the ever-increasing value of space at home. We also know how more and more TV sets are manufactured to have flat screens, and the most convenient manner to place them in your home is to mount them. With the market having quite a number of choices, having a list of guidelines will definitely help you. To help you find the perfect wall mount for your TV, we have made a few useful pointers. These tips should help you decide whether or not a specific TV wall mount is good for you. There are different types of TV wall mounts. These are the fixed mounts, the tilt mounts and the tilt/swivel mounts. Fixed mounts are the most affordable. They do not have any capability of having their angles adjusted. In this case, the TV is actually quite close to the wall, in comparison to the tilt and the swivel mounts. Tilt mounts are capable of having their angles adjusted vertically. That is why they are called a tilt mount; with this, the TV can be tilted. Swivel mounts are actually tilted mounts with a higher capability of being adjusted. Swivel mounts are a great way to have more than one viewing position in your home. Each of them have their benefits. Fixed wall mounts are great if you want stability and you are seated at the front. Tilt wall mounts are great for TVs that are situated high, like ones in the bedroom. 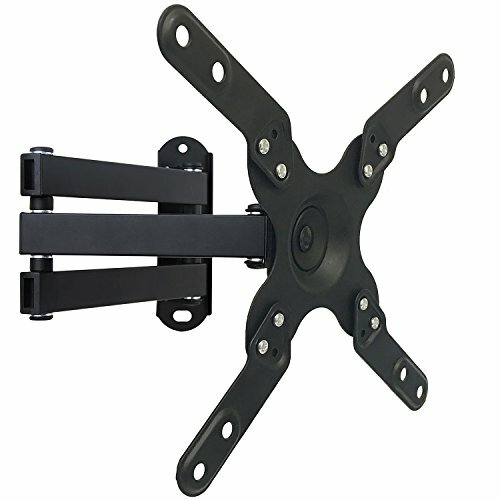 Swivel wall mounts work best for those who want to be able to watch in different positions. 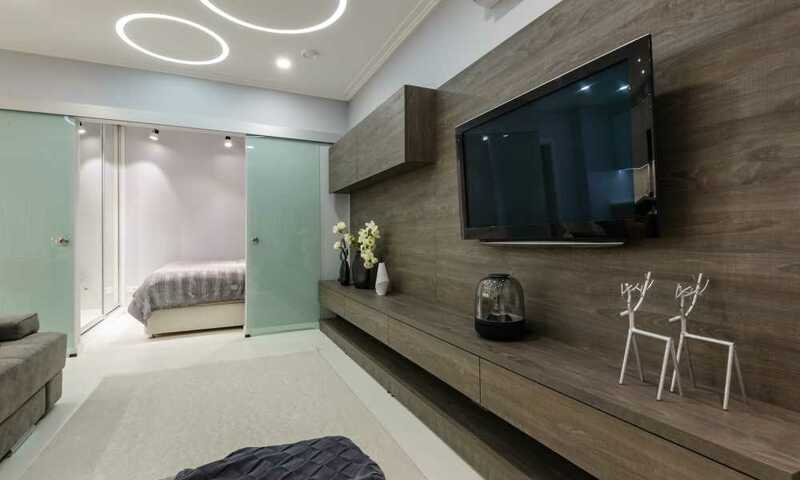 After deciding which kind of wall mount, you should decide first, how big the wall mounts should be (this depends on the size and weight of your TV), the location in relation to where you are seated (seating compared to lying down), and finally how flexible the wall mount is. A general rule for buying a wall mount, and the location for a TV set also, is to ideally have the center of the TV screen at the eye level of the people who would watch it. This is a swivel wall mount. It can be adjusted up, left and right. It can also be rotated. It comes in three sizes. One is for 22 to 50 inches TV sets, another for 26 to 55 inches and the biggest one is for 32 to 75 inches TV sets (important reminder, due to the size and weight of TV sets in this range, tilting can be done but swiveling carries some risks). 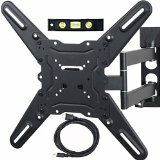 We are reviewing the 22 to 50 inches TV wall mount. The first size can extend up to 20 inches from the wall while the second size maximum extension is 16 inches. Extending more than two inches from the wall is not recommended for the last size. The 22 to 50 inches wall mount weighs around nine and a half pounds. This wall mount’s dimensions are 13 x 10.6 x 2.5 inches. Only requires one stud to mount, compared to other wall mounts that require two. This makes it comparably easier to mount and install. This wall mount can carry up to 88 pounds of weight. Most 50 inch TV sets and under are below that weight. You can be rest assured that it can carry most TV sets, but please do check the weight of the TV set first. The extension of 20 inches from the wall should not be underestimated. This really works well for large gatherings. This extra 20 inches is a big advantage; some wall mounts cannot reach that big of an extension. The best location for this wall mount would be on a pillar or corner. This works great with most people standing up, like some sports viewing sessions with friends. 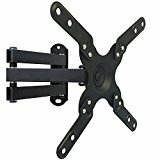 While most 50 inch TV sets weigh lower than 88 pounds, other wall mounts can handle considerably heavier weights. The one stud availability can pose some problems to those who already have two studs installed. The VideoSecu ML531BE TV Wall Mount is a pretty popular mount, and for good reason. It is sturdy enough to fit most tv sets and is easier to install than most. For those who are replacing a wall mount with two studs with this, one piece of advice we can give is to put another surface over the stud like installing a wooden board. This comes from a good company and the quality of this wall mount is great. This is recommended for homes that usually have large gatherings. This is a Swivel wall mount. It can be tilted up to 15 degrees. It can also be rotated. As for the rotation specifically, it can go up to 3 degrees rotation, which sounds small but is actually quite considerable. For the tilting, it can go up 5 degrees and down 15 degrees. This is a heavy lifter! It can carry weight of up to 99 pounds. This is for 26 to 55 inch TV sets. It can be extended up to 16 inches from the wall. This wall mount is 17.1 x 16.5 x 15.9 inches and weighs 13.9 pounds. It is ready to mount. Some TV wall mounts do need some assembly. The assembly, while not being too overly complicated, not only takes extra time, but also run the risk of instructions not being followed correctly. This might compromise the stability of the wall mount. This product does not need much assembly for the wall mount itself. This can carry up to 99 pounds of weight for a TV set. This is a huge weight capacity as it is extremely rare for a 55 inch TV set to weight more than 95 pounds. Due to its design, it can be mounted on almost any stud, be it the 16 inches or 24 inches wooden studs mostly found in homes. It can also be mounted on masonry boards. It helps with cable management with the HDMI cable provided and some Velcro straps, making your cable lines more structured. The extension from the wall only goes up to 16 inches. This is plenty enough for a residential place, but restaurants and other commercial establishments might look for other wall mounts. The angles are not as flexible compared to other wall mounts. This is a great wall mount for those who prioritize a firm position versus flexibility. This wall mount can swivel and tilt, but not as much as other wall mounts. 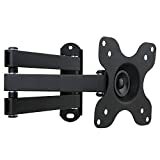 This wall mount may not be the best for those who have a lot of visitors or viewers, but it works really well with a fixed position, like high up on a wall in the bedroom. This is a tilt wall mount. It can be tilted up to 3 degrees. Rotation is up to 3 degrees but not recommended. It is better to categorize this as a fixed to semi-tilt wall mount. This can carry a lot of weight. Up to 165 pounds can be mounted to this without any risk. This is immensely strong. This is a universal mount, meaning it can carry TV sets of most sizes, from a 20-inch LED TV to a giant 75-inch smart TV. No extension from the wall is available. This wall mount has an immensely efficient size to capacity ratio. It is 17.1 x 4.6 x 2.6 inches and weighs only 4.3 pounds but can carry 165 pounds of weight. This wall mount can accommodate almost all TV sets available. It can accommodate virtually any sizes of TV sets, except for industrial or commercial grade TV sets. This wall mount uses universal VESA compliant brackets. This means that most of the TV sets in the market today can fit with this mount. This can carry up to 165 pounds of weight for a TV set. While some 75 inch TV sets are as heavy as a small horse, this wall mount can carry them no sweat. This can extend up to 16 inches (manual states 15.8) from the wall. On the other hand, it can also retract up to 3 inches. This has to be assembled first. While it is actually simple to do, it might be difficult for buyers who will have their first mounted TV set. The TV wall mount will not move. This is both a good and bad thing. Once you have installed the mount to the location, it will be difficult to take it out. 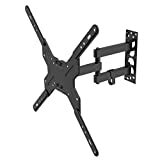 This TV mount also is more of a fixed wall mount than a tilt wall mount. While it does have tilting capabilities, these are not as pronounced as those found in most other wall mounts available. For those who have only one fixed location in their mind, this is the perfect wall mount for you. You can be assured of its strength and durability. However, just be sure that once you have chosen your spot, there are no longer any changes. It is perfect for those with just one viewing location for the house like a theatre room or living room. This is a swivel wall mount. It can be tilted up to 15 degrees. The swivel goes up to 180 degrees and can even do 360 degrees for a rotation! 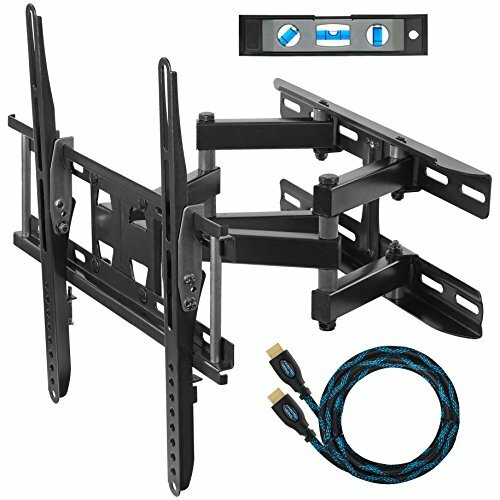 The 13 to 30 inches wall mount can go to 33 pounds. 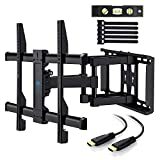 The 13 to 39 inches wall mount has the same capacity of 33 pounds; however, the biggest in the series is for 26 to 55 inches, and can carry up to 60 pounds (comparing it to other wall mount it is above average in weight capacity). 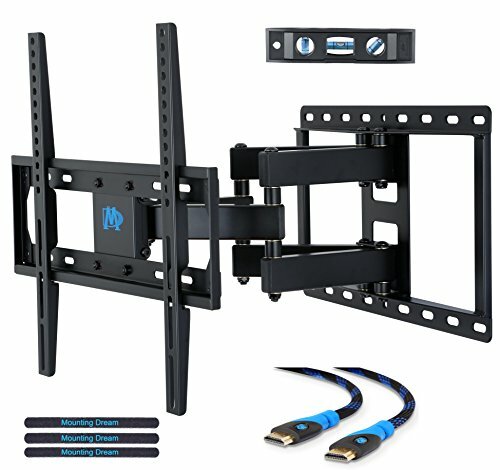 We are reviewing the 13 to 30 inches wall mount. This wall mount uses universal VESA compliant brackets. This means that most TV sets in the market today can fit with this mount. This can extend up to 14 inches from the wall. That is actually high for its capacity. This wall mount is 9 x 2 x 6 inches and weighs 2.4 pounds. This wall mount works really well with smaller TV sets. This is immensely flexible! The rotations work very nicely and have no problems whatsoever with the turning of its angles. This wall mounts can carry up to 33 pounds. That may sound little, but that is actually par for the course; most 30 or even 39 inches should be around the 28 to 31 pounds as a range. This can extend up to 14 inches. That is actually average for the market of the TV wall mounts for sizes of up to 30 inches. It usually takes only around 5 to 10 minutes to install. This is quite small. While that does not really matter for smaller TV sets, you may need to make some adjustments if your TV set is small but heavy, or light but too large. 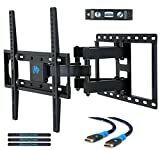 The wall mount for the 13 to 30 inches and the 13 to 39 inches are virtually the same, except for the 13 to 39 inches wall mount being a little bigger. This is immensely flexible, but while it can definitely hold and carry weight, it is better to use it for TV sets that are not as large. This is one reason why we recommend the 13 to 39 inches wall mount than the 13 to 30 inches one. For those who prioritize flexibility over weight capacity, this is the perfect one for you! This only works on the smaller TV sets though, so make sure to know the size and weight of your TV set. This is a tilt wall mount. It can be tilted up to 15 degrees. The swivel goes up to 150 degrees. 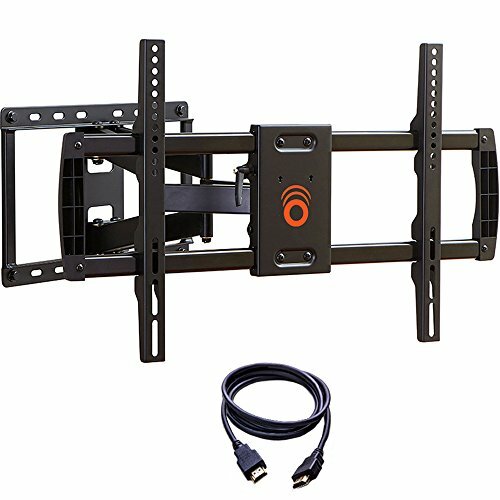 The 37 to 70 inches wall mount can go up to 132 pounds. This can extend up to 16 inches from the wall. That is already high tier compared to other similar products in the market. In fact, some will not even extend at all. You can also push it back to the wall up to 2.5 inches. This is a big wall mount is 17.9 x 12.6 x 3.2 inches and weighs 18 pounds. This is immensely big. It is a bracket, which means the it is designed to be big and unlike other wall mounts, can take up quite a bit of space. Make sure the stud is big. The specifications talk about having a minimum of 16 inches of stud spacing. Make sure you have at least that much to properly counterbalance the weight. For its size, it is flexible! Most of the wall mounts with a similar market with this one can only do a tilt of around 3 degrees. This one can do 15 degrees. This wall mount can carry up to 132 pounds. Some TV sets, especially those around the 70 inches size, can weigh a little over more than that. This can extend up to 16 inches. Again, that is immensely high for other similar products. Of course, the larger the TV, the lower the extension, but the fact still remains that it is capable of that. It takes around 15 minutes to install. That is very fast for a product of this size. While it is capable of carrying up to 132 pounds, this is actually not the wall mount that can carry the most. In fact, for its size, the weight capacity of this wall mount is actually within average. This is the perfect fit for those who have big TV sets and would want to have their viewing be flexible enough for everyone. This is great since it is flexible enough to be tilted and adjusted yet strong enough to handle big TV sets. Finding the best wall mount will depend not only on the quality of the product, but also on what is the priority of the buyer. Generally, the buyer would choose between two things. That is either choosing flexibility or weight capacity. Flexibility means the ability of the wall mount to be tilted or even to swivel. Weight capacity is straightforward; it means how much weight it can carry without worry. Generally, the smaller the weight capacity, the better the flexibility and vice versa. The five wall mounts that are listed above work really well compared to similar products in the market. But, none of them is perfect for everyone. However, each of them is perfect for someone. Before you decide on which wall mount to buy, please make sure that three things are squared away: the dimensions of the TV set, the location, and finally whether to prioritize flexibility over weight capacity.